TEXT 507-380-9344 and our friendly team will quickly assist! Your UnBelizeable Fish Story - But It's True! Experience paradise with your besties! Every lady needs a girl's weekend. With how crazy life is, quality time with friends doesn't happen as often as we'd like. Time with friends is essential for the soul just like sunshine, rest, and laughter. This time is scientifically proven to be good for you so grab your gals and pencil it in! Getting away with the girls is fun, but did you know it's also great for your health and well-being? It has been proven that strong friendships can extend life expectancy and lower chances of heart disease. In 2016, researchers found evidence that spending time with friends can increase the production of Oxycontin, the hormone our bodies make when we're happy! Set a date: We know it can be difficult to work around everyone's schedules, which is why it's important to plan in advance (a year ahead of time is not out of the question!) and get a date set on the calendar. 4-5 nights with travel included seems to be the perfect amount of time for a getaway with the girls. It's not too short and not so long that it's hard for friends to commit to the trip. ​Choose a destination: Choosing your destination is the most exciting piece of planning, as it should be! There are a few things to consider during this phase of planning. Do you want to completely relax and spend your days lounging and chatting with friends, or are you looking for a little adventure? What accommodations are important? Do you want to spend time in a popular tourist destination, or does a place off the beaten path sound better? Want us to do the planning? Book our Girls Getaway package and your activities will be set! The Girls Getaway package includes a manicure, pedicure, one-hour Swedish massage, as well as a guided snorkel trip over our amazing coral reef! It's the ultimate combination of relaxation and adventure. 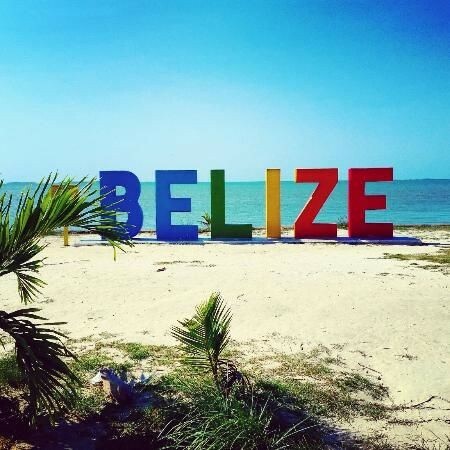 If you're from the United States, Belize is an easy international destination to travel to, as there are many direct flights from the U.S., English is the official language, and U.S. currency is widely accepted. Just grab your passport, pack your bags, and you and your girls are off to an epic getaway! 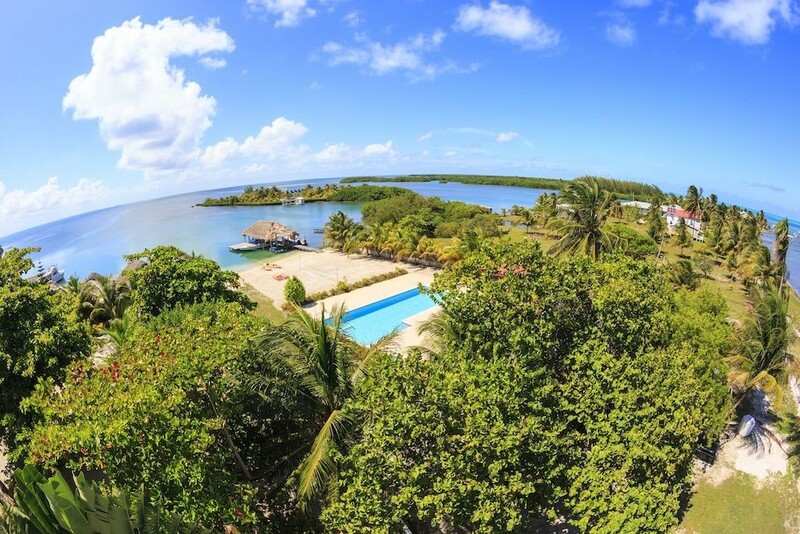 St. George's Caye Resort is found 7-miles from main-land Belize City. Complimentary transfers are made by boat and once you have landed at BZE International Airport, your valet will have you on the island in just about 30 minutes. Offering an array of adventure, romance, relaxation and SCUBA excursions, this resort is acclaimed for pristine reefs, seclusion and the ability to do as much or as little as one wishes. Our need to slow down and become more present in our day-to-day lives is more necessary than ever. This is why wellness travel is one of the fastest growing areas in the tourism industry. Getting away can be essential to recharge and re-establish balance. While a simple vacation is a great way to relax, a study published in a 2016 article for Transitional Psychiatry found that people who participated in a six-day meditation retreat had fewer bouts of depression and stress-related symptoms. 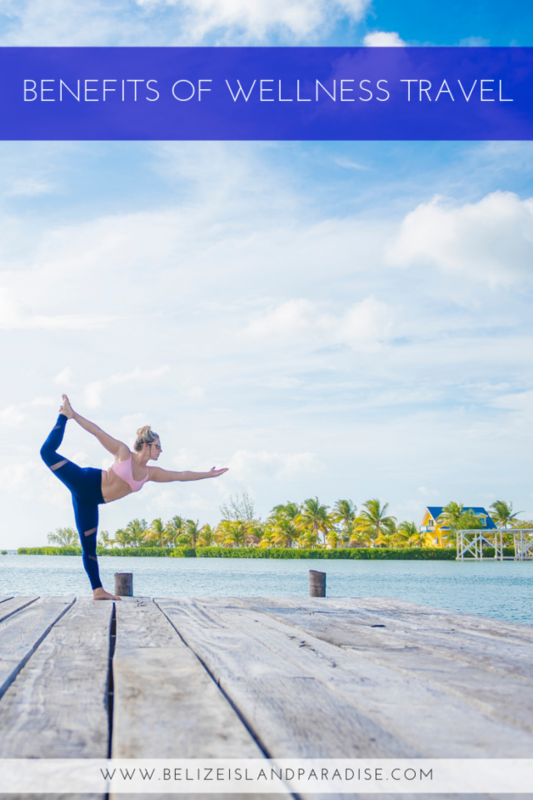 More specifically, yoga retreats are known to improve sleep, quality of life, cardiovascular fitness, anxiety, chronic pain relief, and strengthen the nervous system. Read on to learn about the benefits of wellness travel. Nature allows you to unwind. Imagine basking in the warm sun, breathing in the clean air, and listening to the quiet breezes. You instantly enrich and reset the senses. Taking the time to be present in nature has shown to reduce the production of cortisol, which is our primary stress hormone. 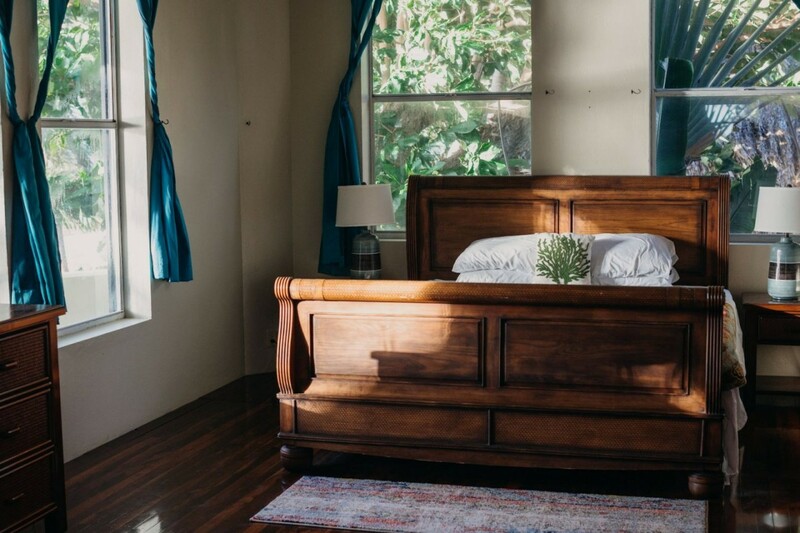 Disconnect from technology: Unplugging may improve quality of sleep as well as your mood! putting down devices and outside distractors allows you to be fully present. Not many people know this (except our previous guests of course) so it is worth mentioning that one of the unique things about St. George's is that you can truly unplug during your stay. Wi-fi is available in the lounge area so you can check in with loved ones, but the rest of the resort is completely unplugged from the internet and TV. Guests love this quality! Decompress and release stress: Taking a break from the daily hustle and bustle of life is essential for your mind to recharge. A 2013 study noted that more than 80% of Americans who were surveyed noticed significant drops in stress just after a day or two of traveling. Spending time with like-minded people: Being surrounded by like-minded people who have similar goals and interests can provide you with encouragement and motivation. 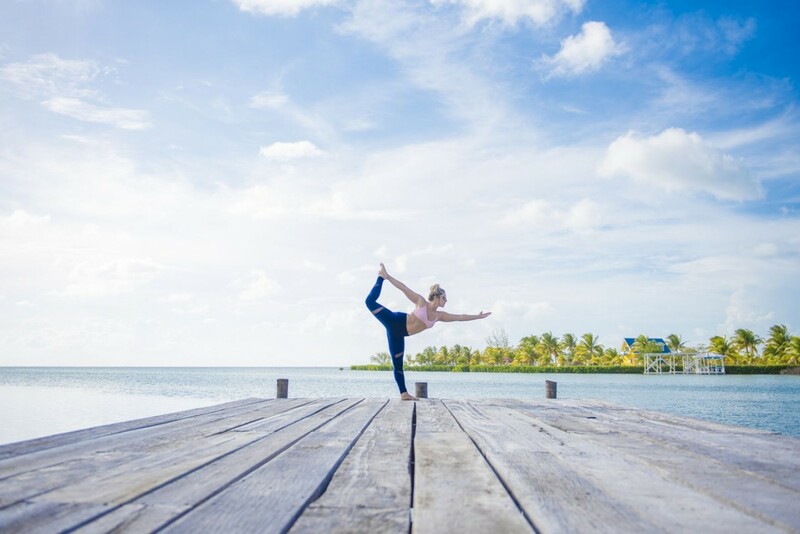 Taking time for yourself: Wellness travel takes you out of your usual routine and mindset and really lets you focus on YOU. Give yourself the freedom to relax, unwind, and recharge. It may inspire you to take time out for yourself far more often than you already do! Sounds good to us! Even on island time, we all individually take time to pause and take in this pristine land and seascape around us. We hope you join us to do the same! Happy Thirsty Thursday from the island! 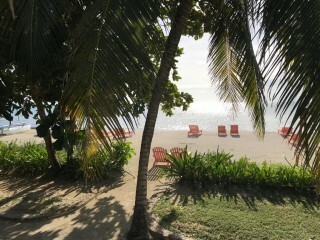 It's a beautiful day to spend an afternoon taking in the Caribbean views and ocean breezes while lying in one of our hammocks with a cocktail or ice cold, freshly squeezed juice in hand. No matter your beverage of choice, we have a little something for everyone! At St. Georges, supporting the local economy is important to us. 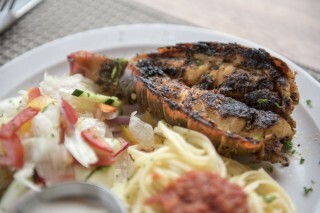 Fresh fish, fruits, vegetables, and juices are sourced locally and are served with pride at every meal! Our servers will even climb a tree to make your tropical island cocktail - it doesn't get fresher than that! We serve the local beer of choice, Belikin, which is brewed "by Belizeans, for Belizeans." 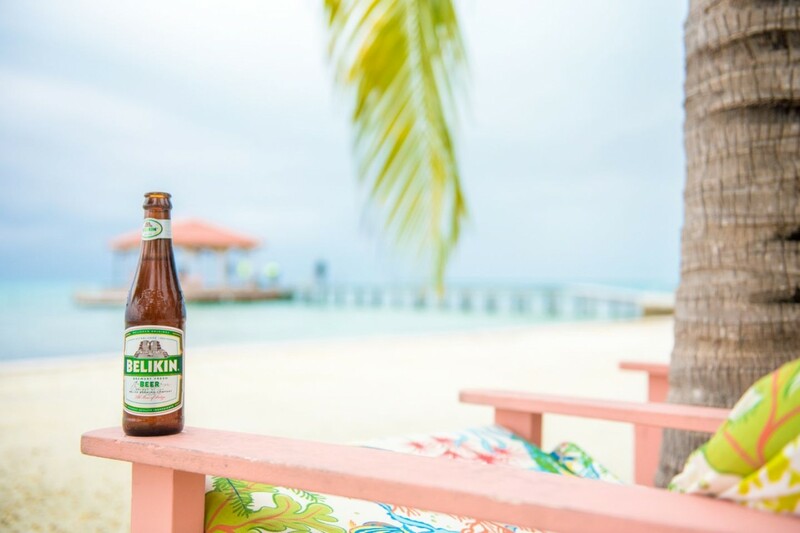 Varieties range from their flagship continental lager, Belikin, which is a special blend of Canadian pilsner malt and German hops, to their unique Caribbean brew, the Belikin Stout. The stout has a subtle blend of coffee, caramel, and chocolate flavors- it's a must-try in our book! Looking for something a little more fruity? We've got you covered! 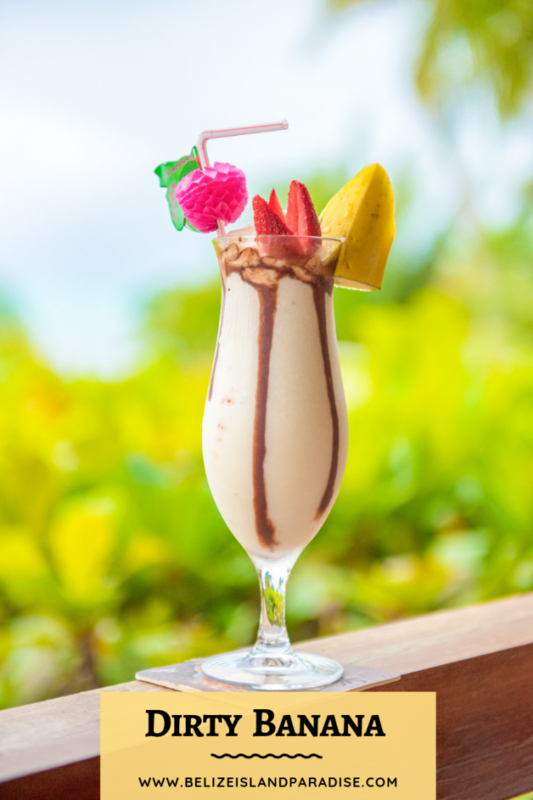 Our world-class servers will treat you to a variety of fruity umbrella drinks such as the Coco Loco, Belize Rum Freeze, or the Dirty Banana (and many more!). Want to make your own "Dirty Banana" at home? Try this recipe to bring you back to the island any time you please! Gather the ingredients. Put 1/4 cup to 1/2 cup of ice in the blender container. Add the remaining ingredients except for the garnish, cover, and blend until smooth, increasing the speed as necessary to thoroughly pulverize the ice. Pour the drink into a small hurricane glass, martini glass, or other cocktail glass. Cut a slit halfway through a banana wheel and hang it on the rim of the glass. Upon your next visit to St. George's Caye Resort, stop by the Sand Bar Lounge inside the main lodge for an afternoon snack and check out our selection of wines, beer, cocktails, sodas, and juices. You can relax in a cushioned chair or ocean-facing swing and enjoy books, games, good conversation, ocean views, and complimentary wi-fi. Invent Your Adventure! - Top 5 Activities Without Leaving the Island! What type of traveler are you? Do you enjoy a vacation full of adventure, or something a bit more relaxing? Maybe you want the best of both worlds and do a little of each. 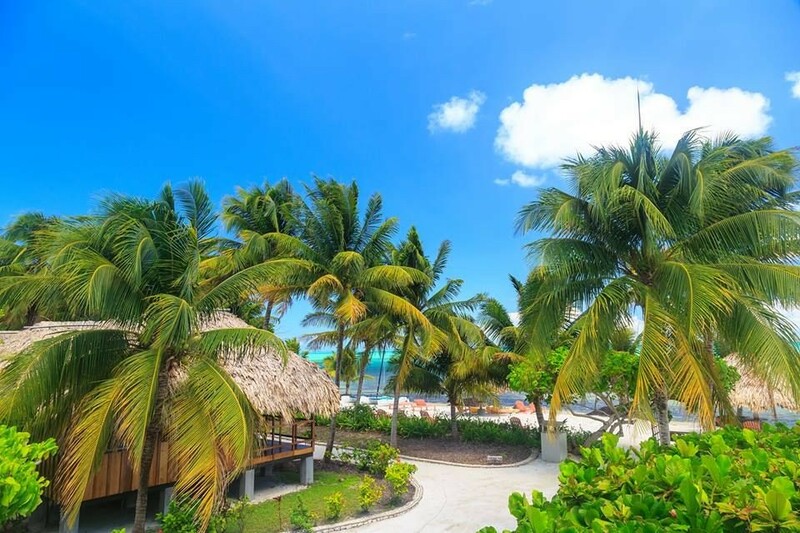 No matter what type of travel is your favorite, we've got you covered here at St. George's Caye! In addition to our off-site Belize adventures, we offer many activities on-site for guests to enjoy. Each guest can truly personalize his or her vacation in paradise! Here are five of our favorite on-site activities (in no particular order) at St. George's. Our guests would agree with us that hammock time is an approved activity here at St. George's. 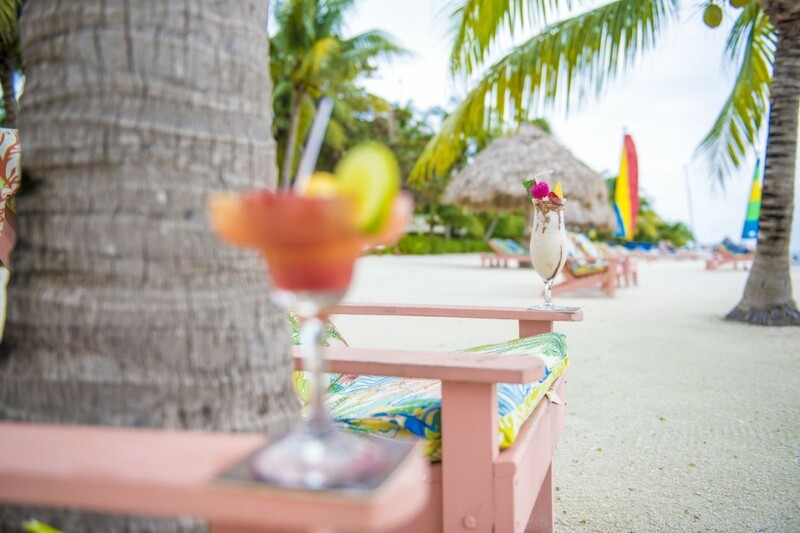 Experience complete relaxation by spending your afternoon napping, reading, or sipping a cocktail in one of our many hammocks around the resort. Ready for a little adventure? 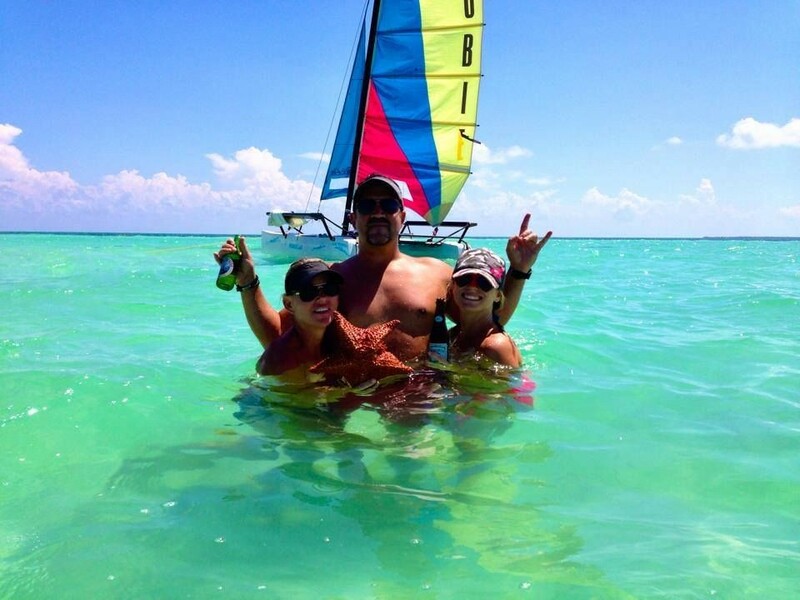 Sail the open sea with one of our three Hobie Cat sailboats! If it's your first time using a sailboat, our staff would be happy to show you the ropes and you'll be sailing in no time! Let our island spa staff pamper you in paradise! Refresh your manicure, enjoy a hot stone massage, or go all out with our head-to-toe pampering package. Whatever you choose, we can guarantee you'll feel refreshed and rejuvenated afterward. Check out all of our spa offerings here. Check out free fishing gear with a staff member (or bring your own gear) and try to hook a Snapper, Grouper, or Snook off our docks! Our staff is also happy to help you find bait and the perfect location to throw out your line. 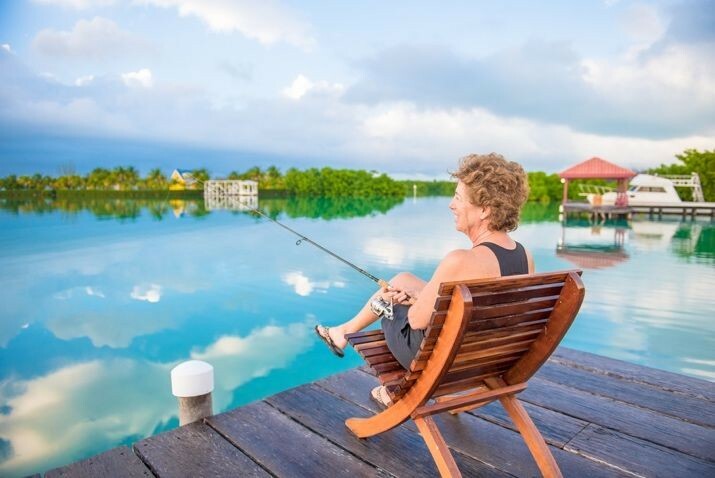 Pro Tip: June, July, and August are the best fishing months in Belize. If you want to take your fishing to the next level, ask a staff member about our charter fishing trips! Grab your complimentary snorkel gear and explore the underwater world right off the beach! It's the perfect activity if you want to stay close to shore and explore on your own time. Pro tip: there are always fish hanging around the docks! ​St. 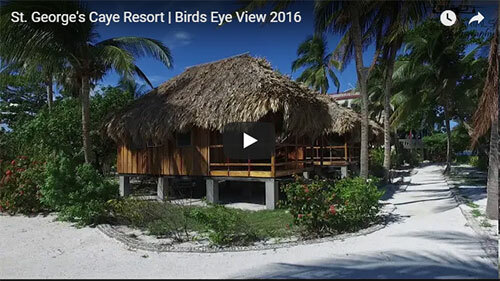 George's Caye Resort is found 7-miles from main-land Belize City. Complimentary transfers are made by boat and once you have landed at BZE International Airport, your valet will have you on the island in just about 30 minutes. Offering an array of adventure, romance, relaxation and SCUBA excursions, this resort is acclaimed for pristine reefs, seclusion and the ability to do as much or as little as one wishes. Belize has some of the best game fishing in the world. 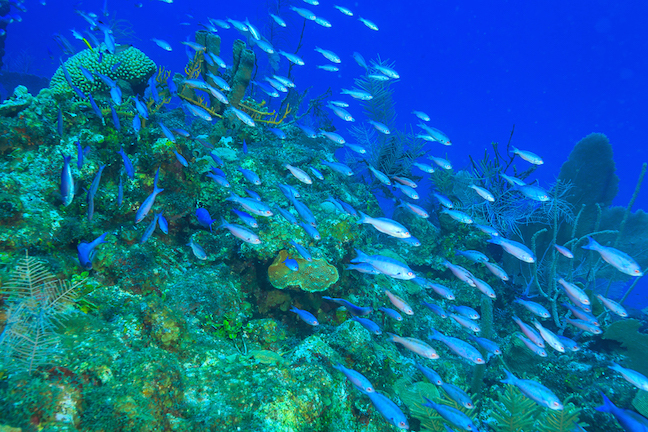 As part of the Mesoamerican Barrier Reef – the largest in the Western Hemisphere – the Belize Barrier Reef offers unmatched fishing opportunities. Some anglers tell us it is virtually impossible to go fishing in Belize and not catch something! No guarantees of course but those are pretty good odds to hope for. An additional factor to consider when planning a successful trip, aside from the health of our local reefs and ecosystems, is to seek out the best local insider information about the best spots. Your guide will know the most populated areas and will work to take you to locations known to host the very fish that you seek, hopefully in huge abundance. Great weather, a relaxed atmosphere and plenty of action are all part of the Belize fishing experience. 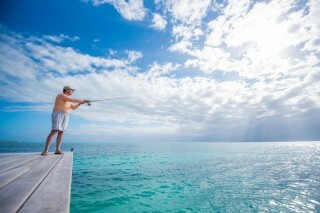 Some of the favorite sport fish in Belize are snook, tarpon, jack, barracuda, bonefish, snapper, permit, plus many more! The local Belize info resource site has up to date information on seasons, population updates and also suggestions on timing for the perfect trip. They write in their fishing info article, "May, June, July, August and early September are considered to be the best fishing months here primarily because there are good numbers of the "Big Three" of Tarpon, Bonefish, and Permit available. Summer temperatures are in the low-to-mid-90s and a steady trade wind generally makes the weather very comfortable." 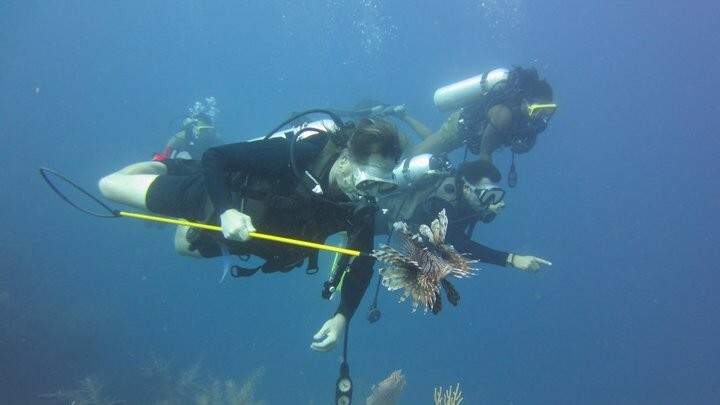 A fun addition to your experience is Lionfish dive hunting. This invasive species has no natural predators and therefore hunting them is necessary to manage their population. Despite their eccentric exterior, they also happen to be a delicious treat. When filleted correctly to eliminate their poison, they are described as "white, flaky, mild, tender, and delicious". When our guests catch their game fish, we are happy to prepare them. Many guests will indulge in their catch of the day with just their group, or better yet, share with the whole resort group. Read more about Lion Fish. 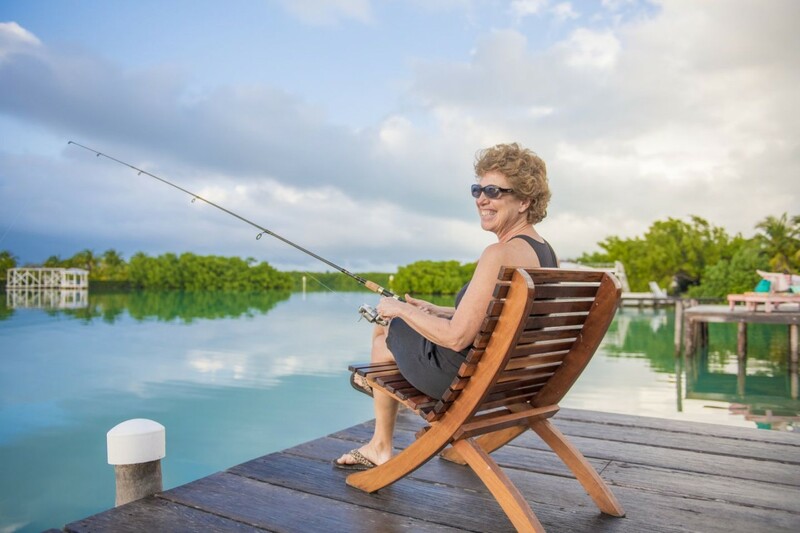 At St. George's Caye Resort, your fishing experience is sure to be memorable as we feature some of Belize's best and most experienced guides. Depending on your particular needs and schedule, packages are customized to fit you and/or your party. It's never too early to make arrangements in order to ensure that all your needs are met. We would love to host you or your group for the ultimate in fishing. Come away to a place where your fish will really be "This big!" St. George's Caye Resort: Fishing Adventure - See 376 traveler reviews, 660 candid photos, and great deals for St. George's Caye Resort at TripAdvisor. 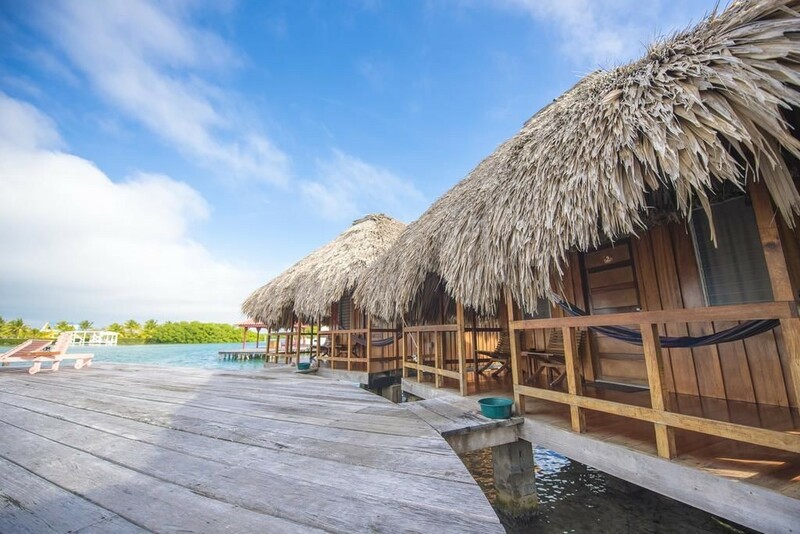 ​The undeniable beauty of Turneffe Atoll and the world renowned Great Blue Hole are just two of the many reasons you will want to add St. George's Caye Resort to your list of diving destination "must-dos". What will keep you coming back is more of a hidden treasure. 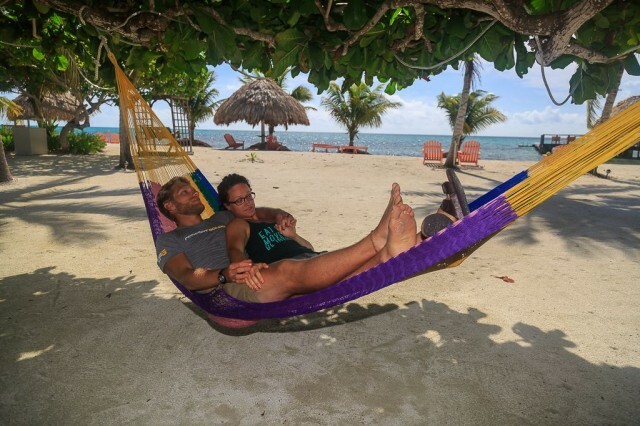 As soon as you meet our dive masters and dive shop manager, you will quickly see why the diving team at St. George's Caye Resort always receives rave reviews. This level of service, knowledge and easy access to your dive sites, paired with the unique seascape makes for the perfect trip. If you would like to help fend off the invasive lion fish species you are welcome to join in some lion fish hunting. Never tried it? Have no fear, the expert team will show you how to safely and successfully capture these beautiful but unwelcome creatures. And anything you catch can be prepared as an appetizer for the group! All guests enjoy incredible experiences. The resort features the best excursion guide in country and will allow you the opportunity to take your time and truly immerse yourself in the amazing culture. 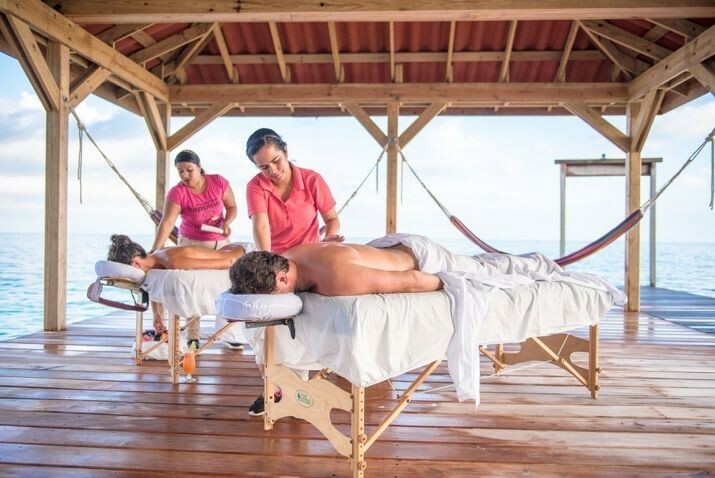 During any down time on the island St. George's Caye Resort provides a variety of unique experiences from ultimate jungle adventure to complete relaxation. 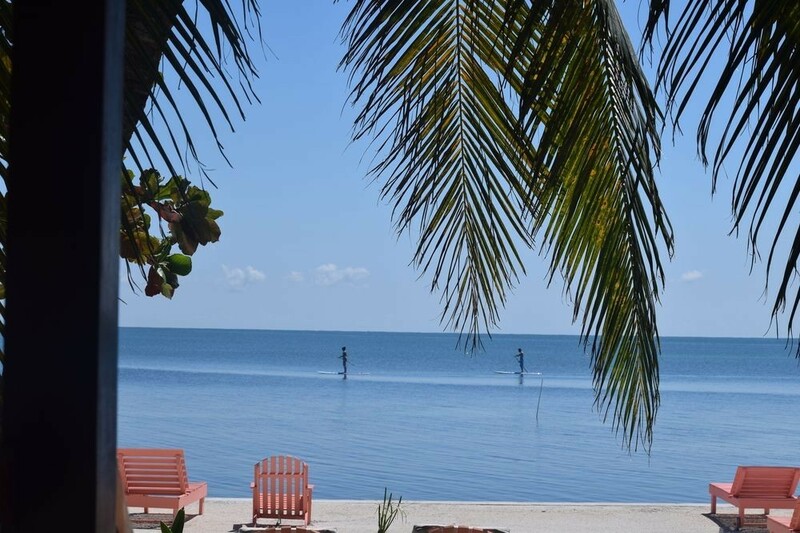 There is plenty of opportunity to take advantage of the complimentary kayaks, SUPs, hobie cat sail boats, fishing off the docks, and hammocks all around the property. Many find the perfect down time at the tropical island spa. And then there's the food prepared by the incredible professional chefs – something you have to experience to understand. All special menu needs are accommodated and the fare is fresh, local and authentic. Try SCUBA enables you to experience breathing underwater using SCUBA equipment under the direct supervision of our instructor in a safe and controlled environment. Included is a brief gear orientation followed by instruction in the pool. The unique location of this dive resort is not only incredible because of its proximity to the reef but also because of its proximity to Belize City. Within minutes of passing through customs, you will be greeted and within about an hour you will find yourself settled on the caye ready to meet with the dive masters and plan your dives. Our easy by-boat transfers save you a half day travel on arrival and another half day travel on departure will give you that extra time you crave from your get away and will get you into the water that much faster! 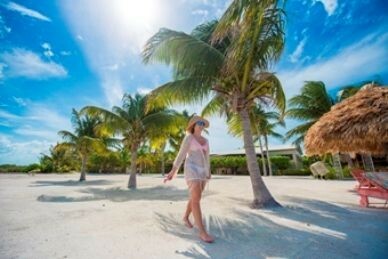 With complimentary transfers guests save more than $150 per person compared to most island resorts in Belize. Whether time or money is more valuable to you, either way you are covered! 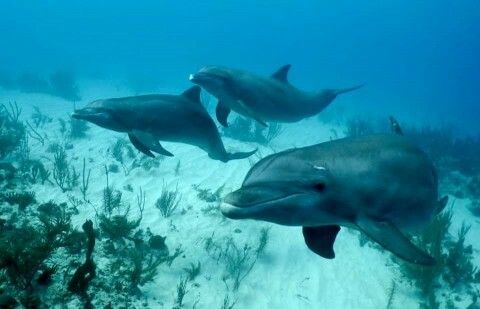 Find your perfect trip at www.belizeislandparadise.com for incredible diving specials and use promo code #DIVE2019 when reserving your trip. Most people know that the top New Year's resolutions made are for better health and balance of responsibilities with time to enjoy the important things. When thinking of health, many will run out and join the gym or pick up the latest Pilates video series with hopes of refining their body. What are other things that effect this overall goal? For many, living a fast paced life means there is little time to pause and enjoy the world around them. This is shown to drastically effect health adversely. At St. George's Caye Resort and surrounding destinations we see travelers for many reasons. Guests may be celebrating the beginning or rekindling of romance, bucket-list diving, seeking adventure, or just to escape from it all. Most importantly we see people begin their trip still wanting and needing to feel connected with their phones. Slowly but surely that "connection" become less and less important as they reconnect with life, environment and relationships. NBC News featured an article on 5 Scientifically Proven Health Benefits to Travel. With all of these compelling reason to travel and admittedly, a pretty sizable planet, how do you narrow where you are going this year? 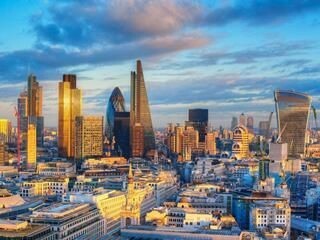 If you thrive in an urban environment, you may want to travel to New York City or London. 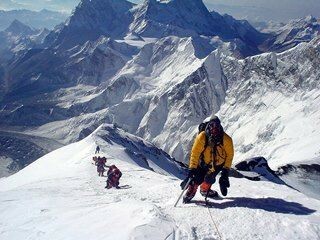 If you are meant to brave the wilderness, working to survive the elements, possibly Tanzania or Nepal suit your travel fancy. 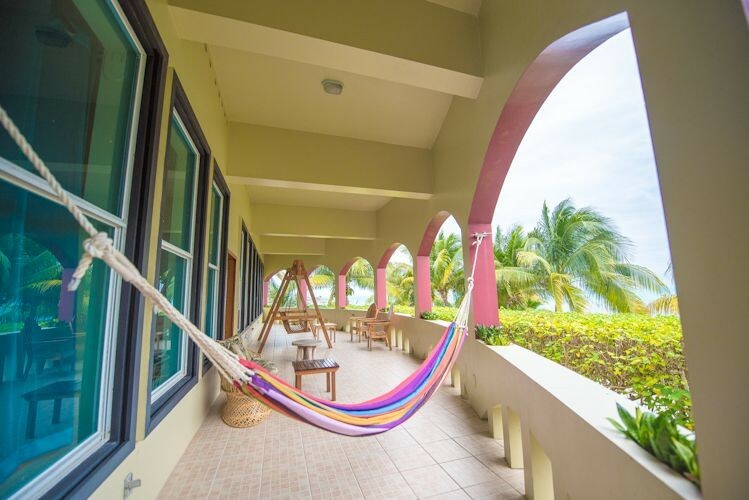 Conversely, if you wish to relax and be pampered while completely unplugging and enjoying adventures of a lifetime, Belize may be just the ticket. Cheers and see you in the sun in 2019! 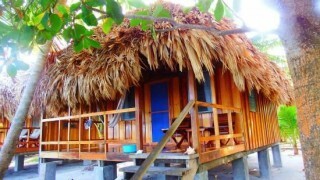 St. George's Caye Resort is found 7-miles from main-land Belize City. Transfers are made by boat and once you have landed at BZE International Airport, your valet will have you on the island's sandy shores in under 30 minutes. 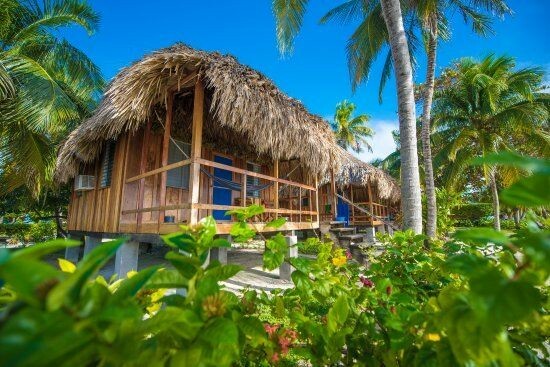 Offering an array of adventure, romance, relaxation and SCUBA excursions, this resort is acclaimed for pristine reefs, seclusion and the ability to do as much or as little as one wishes. 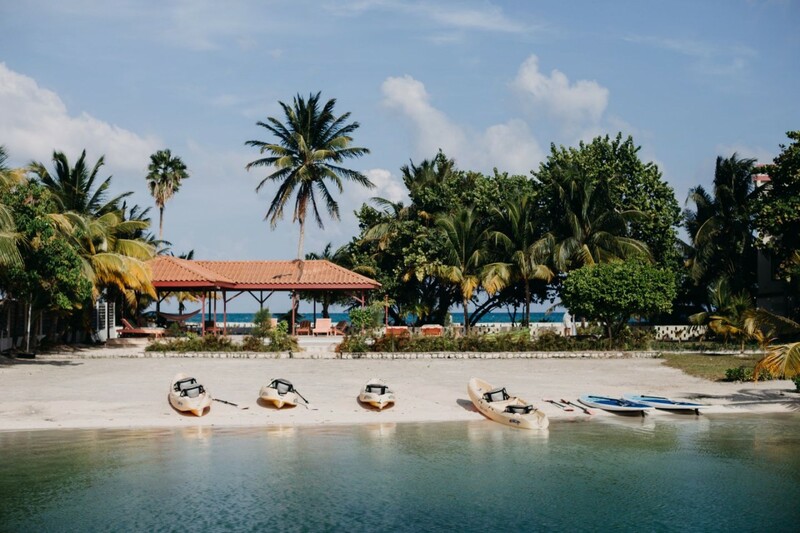 ​It is worth noting, especially after appearing on multiple winning lists, Belize is topping the charts as a must-do destination in 2019. The one and only National Geographic, just ranked Belize in the top most EXCITING of destinations of 2019. The legendary travel guide publisher, Lonely Planet also published their post of the Top 10 Recommended Places to travel in 2019. 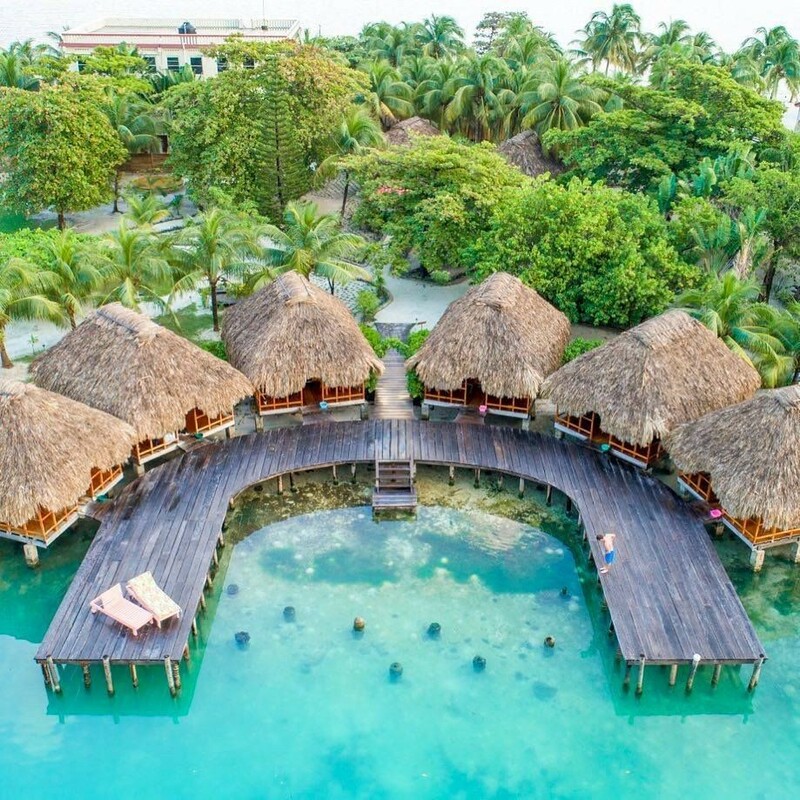 This is the second year in a row that Belize has risen to the top, also featured on the British publication, The Telegraph and also MSN.com Lifestyle article on 2018 top destinations. 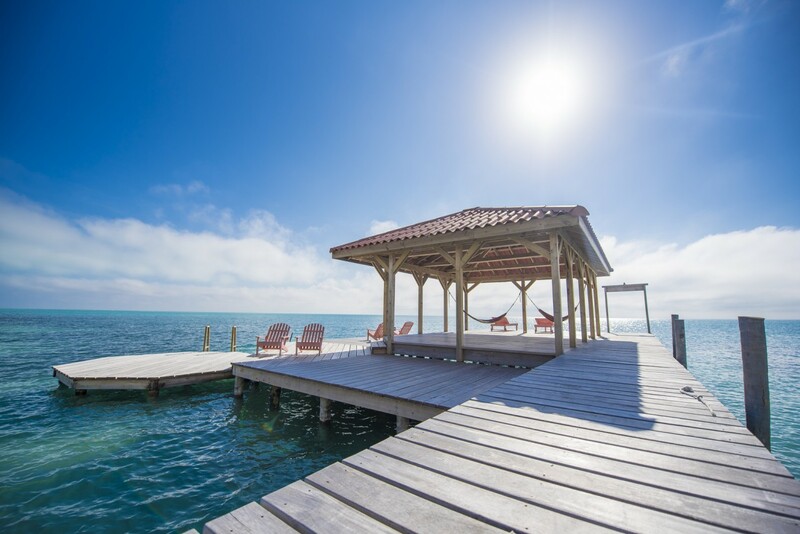 Whether you are a worldly traveler, or this is your first time as a globe trotter, you will find Belize to be a warm welcome! 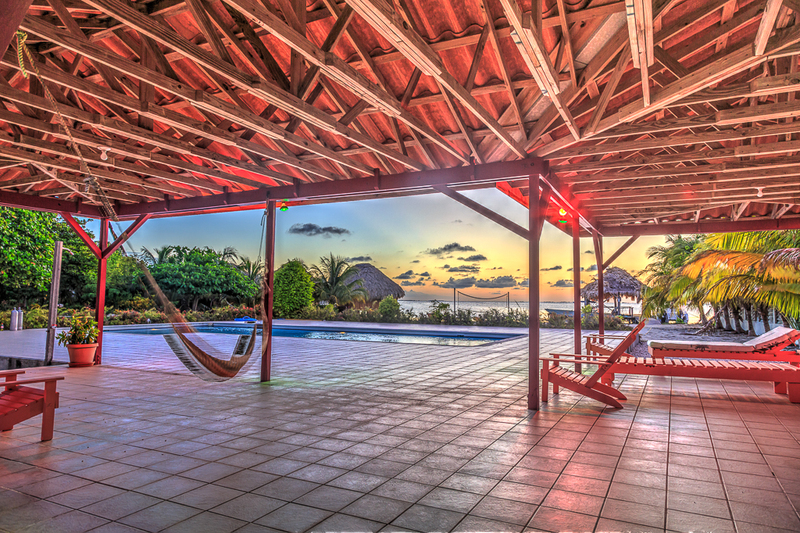 We have created a gallery of options for your stay in Belize. We figured it would be more fun to read this way! 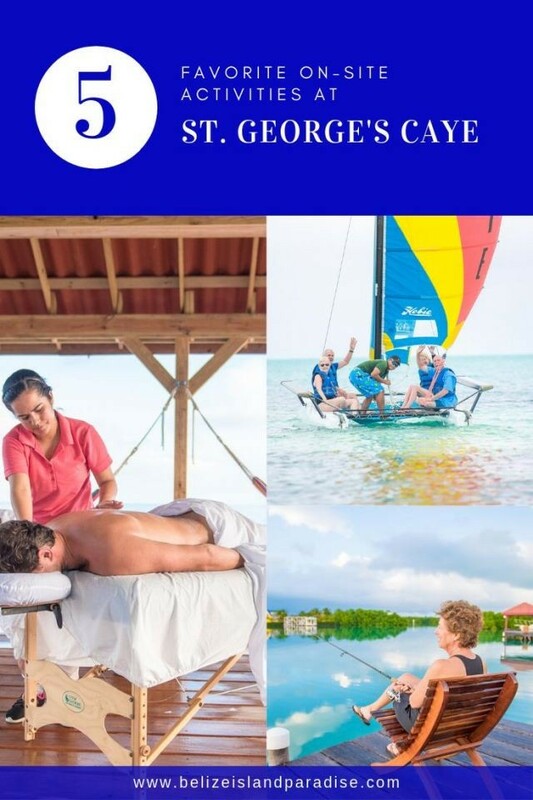 Click Here to learn more about all that you can do while in Belize and at St. George's Caye Resort! 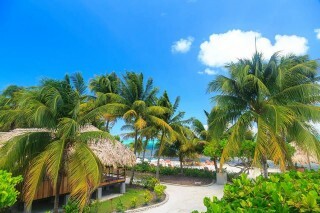 ​What makes this small country of Belize so special, and in contest with other much larger, iconic travel destinations? Whether you are planning a wedding, eager for some warm weather fishing or just looking to escape to a place that truly allows you to disconnect, Belize offers the best of all worlds. Don't just take it from us. Click here to read more on reasons to visit. We may just have a subtle suggestion on a great destination! 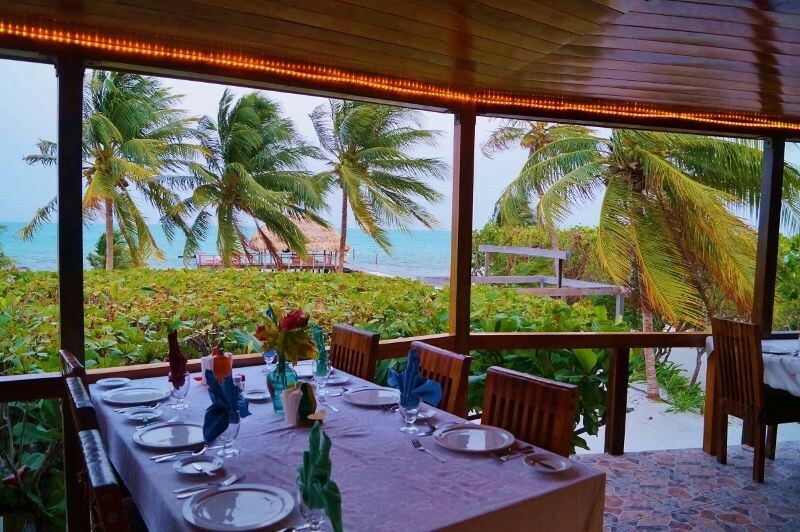 St. George's Caye Resort is found 7-miles from main-land Belize City. Transfers are made by boat and once you have landed at BZE International Airport, your valet will have you on the island's sandy shores in under 30 minutes. Offering an array of adventure, romance, relaxation and SCUBA excursions, this resort is acclaimed for pristine reefs, seclusion and the ability to do as much or as little as one wishes. Take a second and think back to around this time last year. Here, let us help. You were likely surrounded by family, food and friends. The mood was holiday-ish and you were ferociously giving or preparing to exchange gifts with everyone around you. Now, what did you receive? Do you remember? Ok, mental test, do you remember the vacations / mini-trips you took last year? Maybe it was a trip to the local theater for a play, or a concert or big league baseball game. Or, maybe you traveled to a foreign land or simply just a stay-cation at a local hotel. Chances are you not only remember where you went but can visualize and tell a story of the experience in vivid detail. ​This is a great case for experiences as gifts. 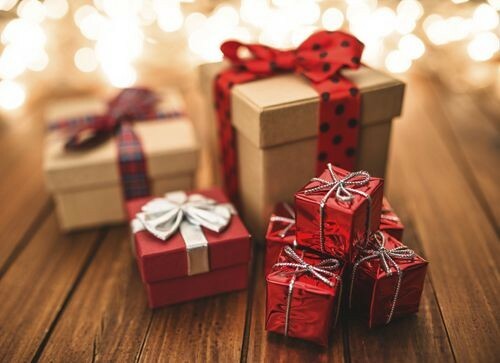 This year, instead of heading to the local big box store to buy gift cards for the closest restaurant chain, or worse yet, a gift card to that said big box store, try buying a portion of, or an entire experience for your loved ones. A Cornell University Study finds that, "The satisfaction we get from buying vacations, bikes for exercise and other experiences starts high and keeps growing. The initial high we feel from acquiring a flashy car or megascreen TV, on the other hand, trails off rather quickly…" "Your experiences are inherently less comparative, they're less subject to and less undermined by invidious social comparisons," said professor of psychology Thomas Gilovich, who published the study with Travis J. Carter, Ph.D. '10, in a recent issue of Journal of Personality and Social Psychology. This experience can be as simple as a local vineyard tour, or as complex as international travel. They key is to give the recipient the chance to make memories of a lifetime and relish in your gift for years to come! Best wishes and Season's Greetings from St. George's Caye Resort! Three-time gold medal cyclist, Kristin Armstrong was quoted in saying, "It's not only moving that creates new starting points. Sometimes all it takes is a subtle shift in perspective, an opening of the mind, an intentional pause and reset, or a new route to start to see new options and new possibilities." Perspective is a vantage point that is purely your own… Or is it? We often receive pictures and videos from our guest. They have enjoyed this seclusion and natural beauty of our island and what they capture is awe inspiring. On this occasion, we wanted to share another's fresh perspective of paradise. Maybe it will help you to gain a new outlook too. Thank you, Leah Flores for capturing these moments. 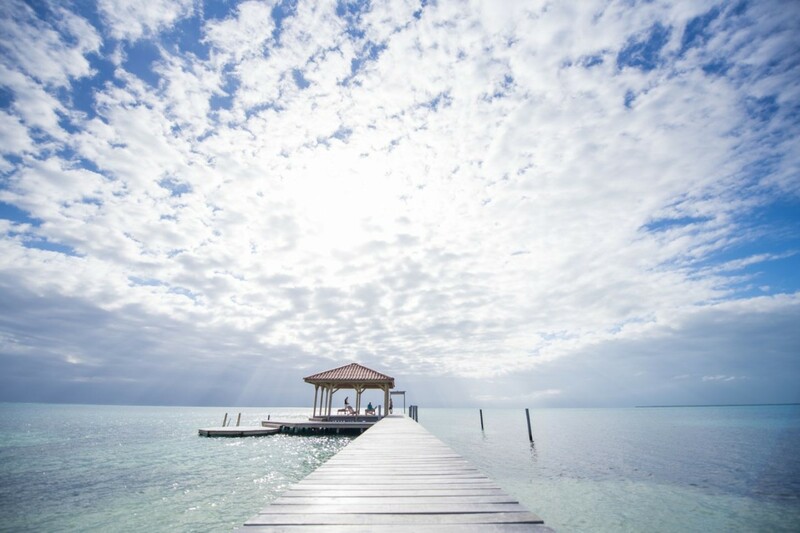 Spend hours in total relaxation next to the Caribbean teal blue, allowing time to think in peace or to totally clear your mind, body and soul. Return to home feeling relieved, reflective and restored. 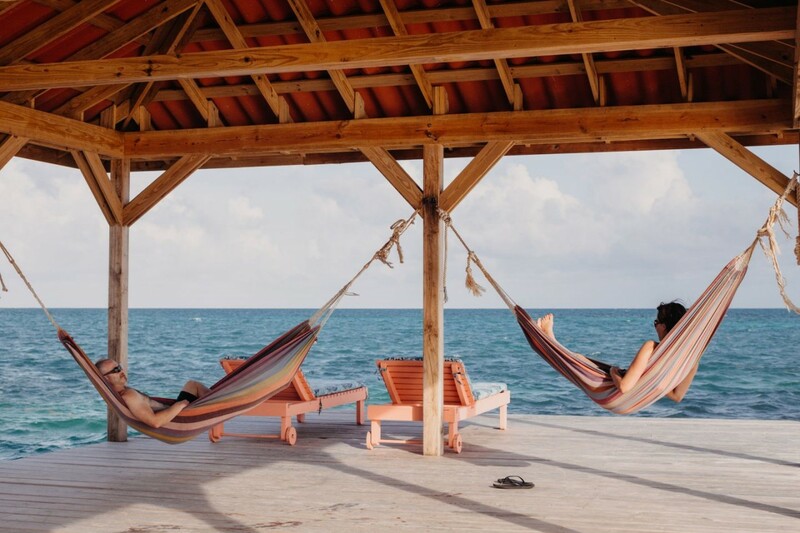 St. George's Caye is a place, far from the hustle and bustle of the day, where you can disconnect and share in experiences that enrich many facets of life. From adventure to relaxation or romance, the island is truly made for any vacation desires. The views are breathtaking and the options for activities are endless. 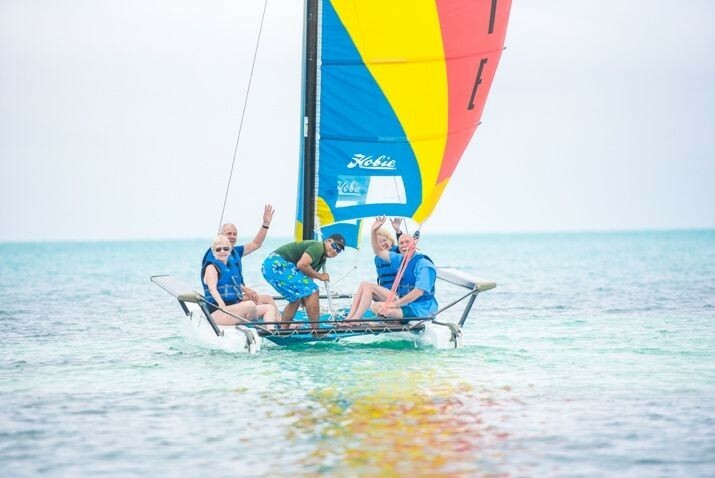 Learn to SCUBA dive or snorkel, grab a hobie cat or kayak and explore the clear blue waters, or simply relax next to the saline pool and soak up some rays. At the end of your day, spent however you wish, fall back into the comforts of home away from home. 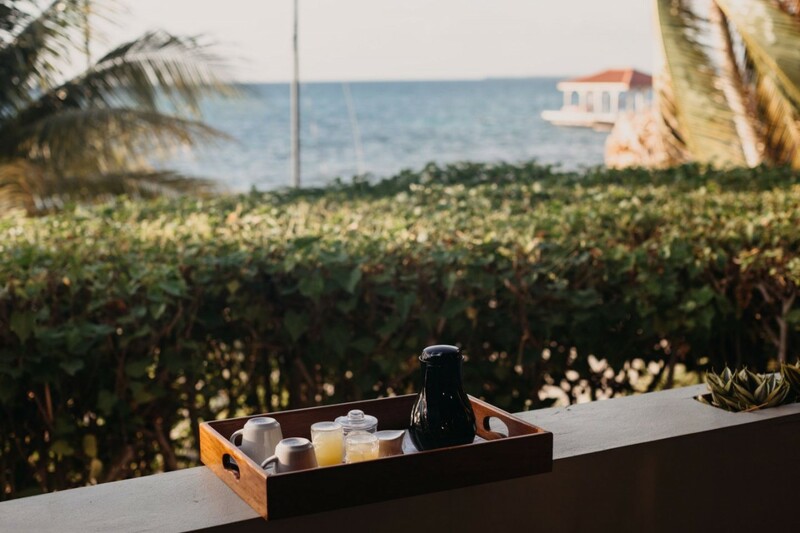 With a full belly and a day full of relaxation or adventure, you will find the ultimate relaxation in our sunrise oceanfront, sunset over the water, or tropical garden cabanas, or in our immaculate oceanfront villa suites. Kristin Armstrong said it best, "When everything is moving and shifting, the only way to counteract chaos is stillness. When things feel extraordinary, strive for ordinary. When the surface is wavy, dive deeper for quieter waters." We invite you for a change of perspective at the island. Message us today to come away! 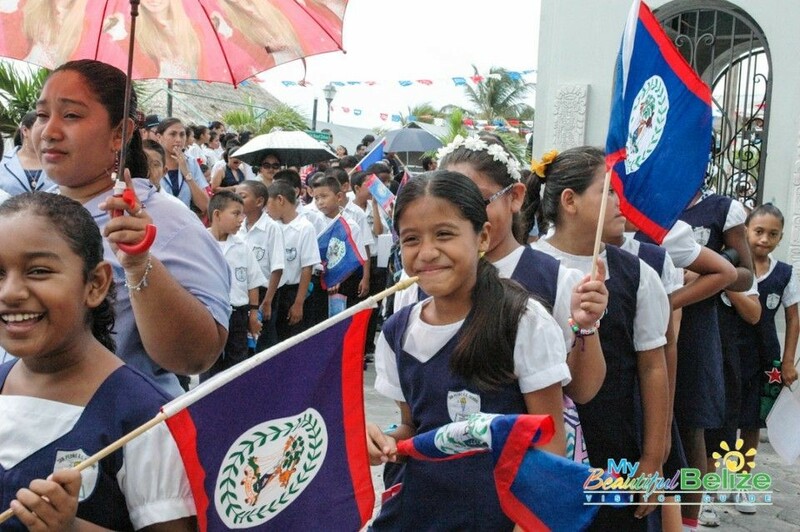 On September 21, 2018 Belize will celebrate their 37th anniversary of independence. This day commemorates when the nation was granted independent status by Great Britain in 1981. Celebrations run from 'St Georges Caye Day' on September 10th right up until Independence Day, on September 21st. During this time, Belizeans and tourists alike partake in prideful flag waving, display of colorful patriotic decorations, numerous vibrant parades, lively singing and dancing, carnivals, and indulgence in tasty feasts of local Belizean cuisine. There are also official flag raising ceremonies and more solemn observances, along with educational events on Belize's history and culture. The celebrating continues for much of the month and is known collectively as "The September Celebrations." 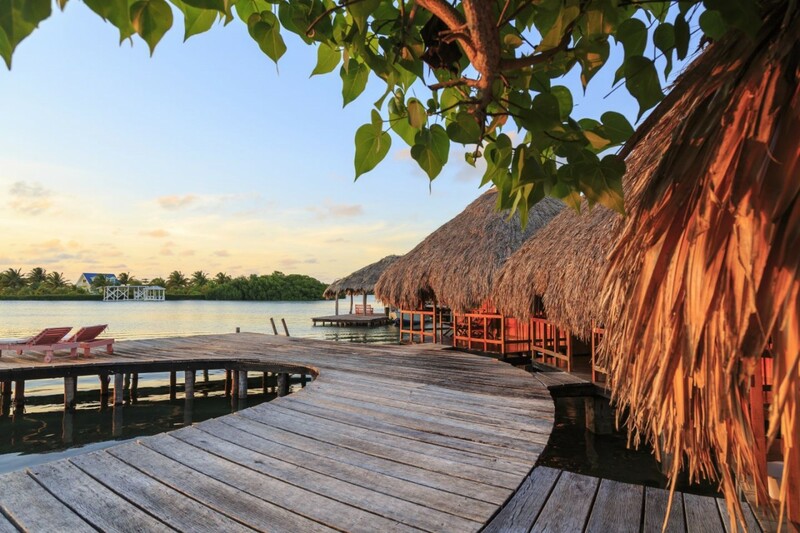 September is a great time to venture to Belize. Tourism is still in the lower season so great group rate discounts and other specials are plentiful. Diving is desirable year round and at this time of the year can be coupled with other cultural excursions or just a little R&R. European colonists first arrived in the area in the 1500s and clashed with the surviving remnants of the ancient Maya Empire. Early attempts by Spain to formally annex Belize were hampered by strong resistance from the Maya. English buccaneers later gained a foothold on the coast region, using the area to launch attacks on treasure-laden Spanish ships from Panama and Venezuela. By the early 1700s, English settlers known as "Baymen" established a presence in Belize, logging the valuable hardwood for export back to Europe. 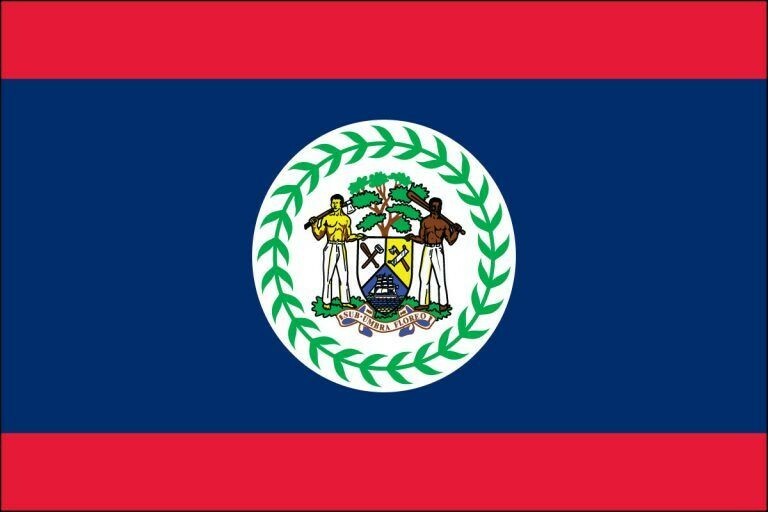 Today, the Belize flag features a stylized English "Bayman" logger in recognition of this part of the country's history. Although the Spanish initially tolerated the presence of English settlers in the area, things came to a head in 1786 when the British government appointed an administrator to oversee the region. After several years of clashes, the British gained full dominance over the region following a decisive naval battle off the coast of St. George's Caye on September 10, 1798, a date now celebrated as a national holiday in Belize. In 1862, Britain formally annexed the area, naming it British Honduras (after the Bay of Honduras, not the modern-day country of Honduras). In 1954, constitutional reforms were enacted and a constitution was written. In 1964, Britain awarded the colony self-rule and George Price became the colony's first premier. In 1973, the colony was renamed Belize and the country was granted full independence in 1981. Chances are you've heard about "reef-safe sunscreens" and the importance of using sunblock that doesn't contain harmful chemicals. But which chemicals are harmful? What does that even mean? In May of this year, Hawaii passed a bill that prevents the sale of sunscreen containing UV-filtering ingredients, like oxybenzone (the most common compound found in nearly 3,500 sunscreens worldwide), octinoxate (even more toxic that oxybenzone, but usually found in lower concentrations), and octocrylene. These are the dangerous chemicals have been linked to coral bleaching. A good rule of thumb: the simpler the formula, the better. A great alternative to using sunscreen when diving or snorkeling is to wear a long-sleeved sun shirt or rash guard with a UPF (UV-protective fabric) of 50-plus. It should have a crew neck and ideally will have a thumbhole to hold the sleeve over the top portion of your hands. More coverage, less sunblock. WHAT DOES OXYBENZONE DO TO THE REEF? According to Craig Downs, Ph.D., a forensic ecotoxicologist in Virginia and Executive Director of Haereticus Environmental Laboratory, oxybenzone can damage coral DNA and might lead to what Downs calls "reef zombies" or corals and other reef organisms that look "healthy, but are actually sterile and dead - so they cannot reproduce." 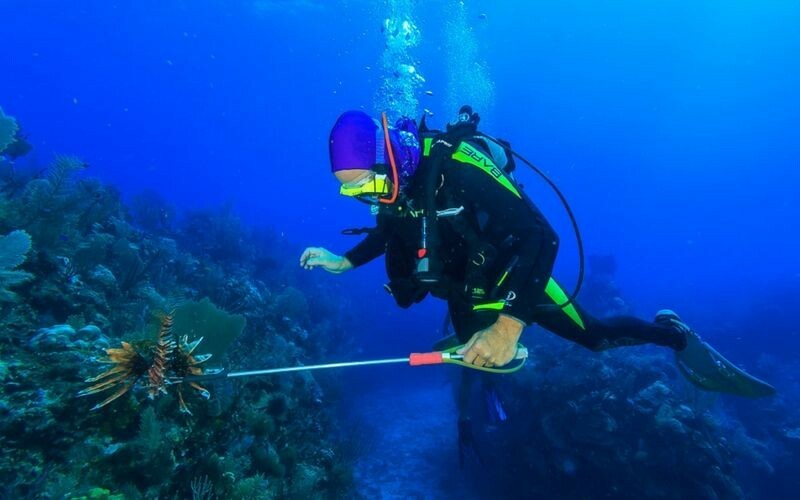 Such UV-absorbing compounds can also contribute to coral bleaching, which occurs when the life-sustaining algae that normally lives on coral vanishes, due to changes in ocean temps, stress or pollution. With these chemicals in the sea water, viruses can thrive, putting corals at risk of catching an infection and possibly lead to bleaching and death. So, with information in hand, we'd like to give our some advise on buying a reef-safe sunscreen before you visit us at St. George's. We care about your skin as well as our reef - so here's how you can help protect both! Just in case you didn't have time to go shopping, or forgot your reef-safe sunscreen at home, we have them available in our gift shop! We regularly get questions from scuba divers as they prepare for their trip to Belize. What is it like diving the reef in Belize? Which fish and animals am I most likely to see? 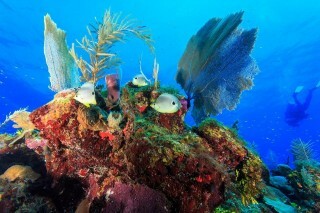 Snapper: So here is a list of our favorite underwater sights on the reef near St. George's Caye. From our island, it's only a 5-15 minute boat ride to a variety of pristine dive sites. We are the only dive resort in the area, so there are no other boats or divers - it's like having the reef all to yourself! Many of the fish and creatures that divers encounter can also be seen on our private guided snorkel trips over the coral reef. On the Belize reef you will also see Barracuda, Snook, Squirrelfish, Wrasse, Horse-eye jacks, Belize permit, Tarpon, Bonefish, Fairy Basslet, Spotted eagle ray, and Stingrays. (We also have a beautiful, but invasive species named the Lion fish. We removed over 1,000 from the reef in October 2016 during our Lion Fish Dive Tournament). Our warm Caribbean waters also have Squid, Conch, Octopus (more often seen on Night Dives! ), Dolphins, and the ever-popular Green sea turtles and Hawksbill turtles (so cute!!). 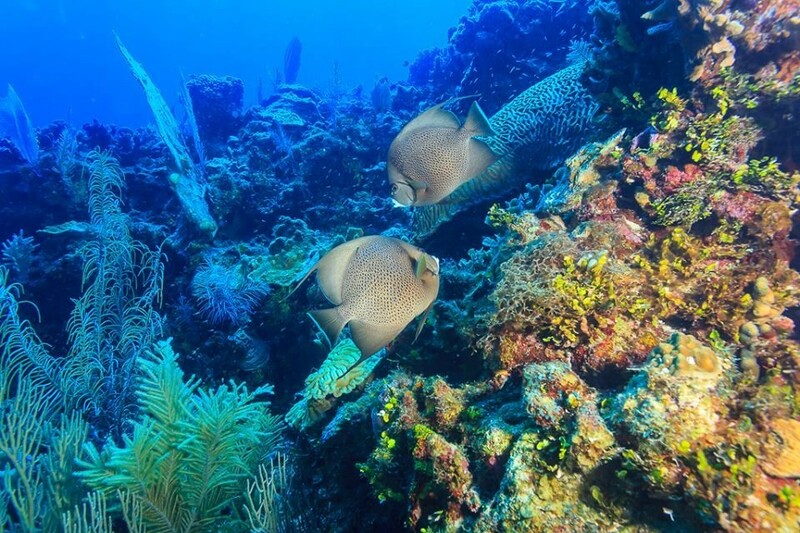 In the waters of Belize, you can also see a variety of Jellyfish, Blue Tang, Lobster (if you enjoy eating lobster, the season is mid-June to mid-February), and a variety of coral: Stag Horn coral, Brain coral, Elk Horn coral, plus many more. Want to know more? 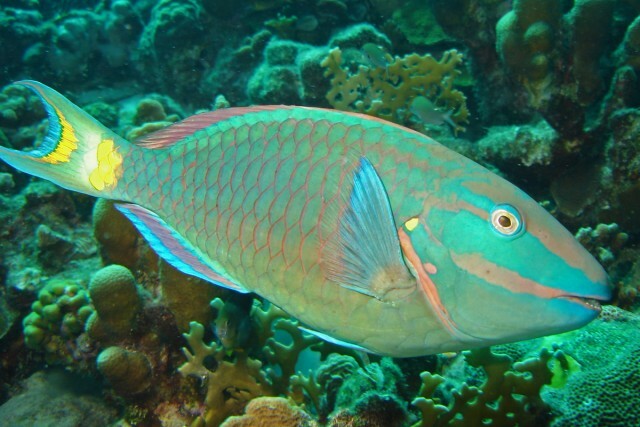 Here's a fantastic website with "dive reports" on the fish species seen while diving in Belize. Have questions about diving in Belize? 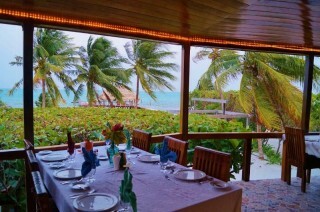 Online Gift Registry Now Available: Guests Can Buy You Amazing Belize Experiences as Wedding Gifts! 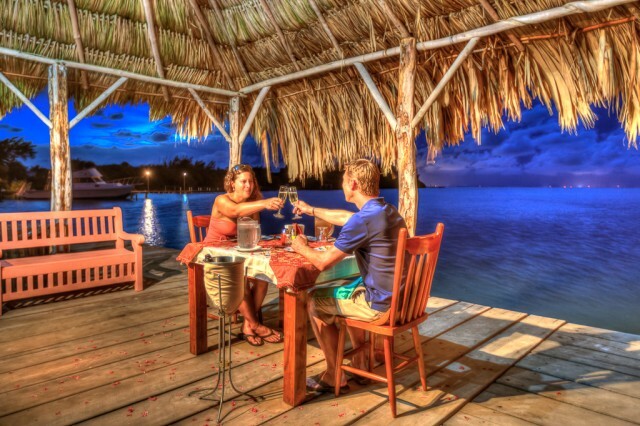 Your wedding guests would love to help you experience your dream honeymoon in Belize! We're excited to announce we now have an online registry where you can create your own personalized honeymoon gift registry. Not only can guests contribute gifts towards your private Overwater or Oceanfront Thatch Cabana on the beach, they can also purchase special experiences you select such as spa treatments, breakfast in bed, mainland jungle tours, scuba diving, snorkeling, and a private happy hour for two at the sandbar near the reef. 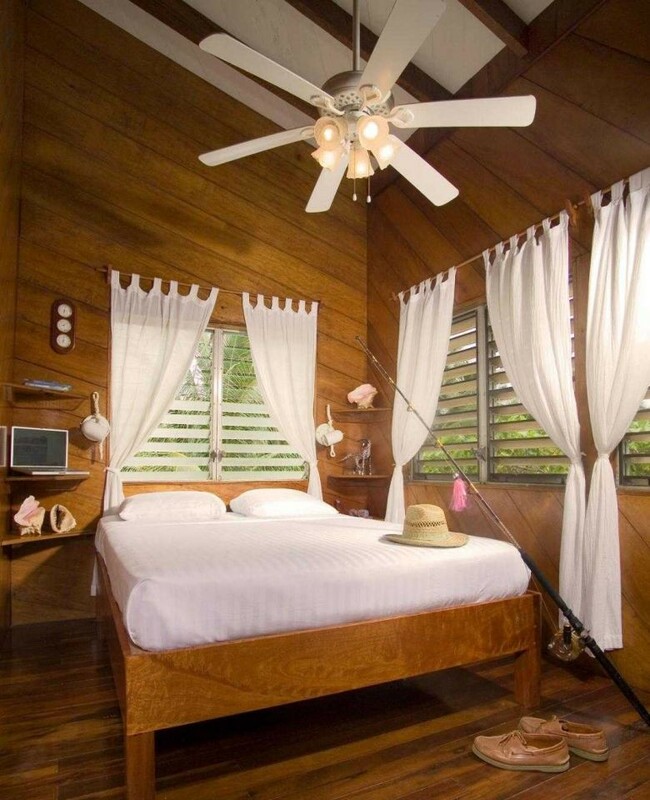 Check out our new Gift Registry in the Romance & Honeymoons Packages section of our website, or by going directly here: https://belizeislandparadise.celebrationwishes.com/ Simply click "How It Works" in the upper right corner to get started! Online instructions are provided as you go, so it's easy to browse and select the items and experiences you want to add to your registry. Using our Gift Registry system, you can also create a free personalized wedding website and send announcements to all of your friends and family! 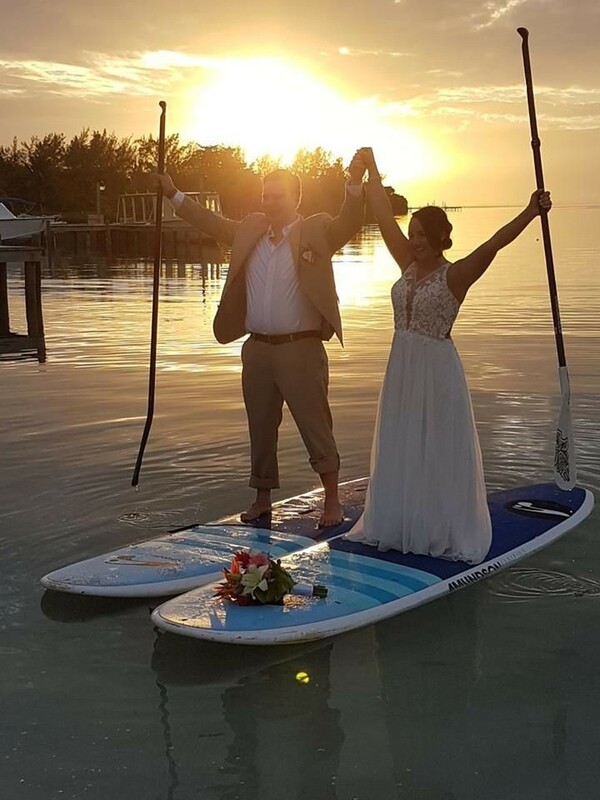 Now your wedding guests can help give you the experience of a lifetime and, more importantly, you'll be on your way to creating your first memories as a married couple with an amazing honeymoon in Belize. St. George's in The Hall of Fame from TripAdvisor - Again! Yay! 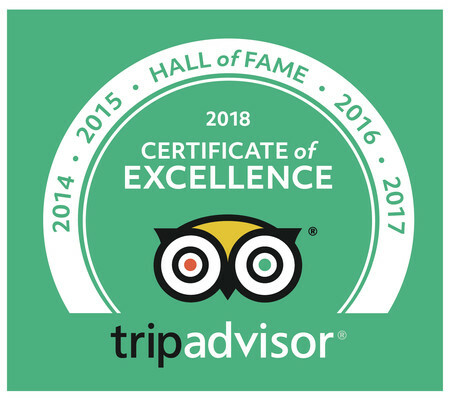 Thanks to your guest reviews the team at St. George's just earned another Certificate of Excellence from TripAdvisor -- AND receiving this Certificate for the last five years gets us in the Hall of Fame! We are beyond thrilled and so proud of our team. Read our announcement from last year: We're Blushing! 2017 Experts' Choice Award and Best of Belize. On behalf of our team, THANK YOU from the bottom of our hearts! This means the world to us -- we live for your reviews. 2018 is off to a great start in continuing our unmatched level of service. In fact, we have some surprises up our sleeve for you. Come visit us again soon! Have you seen the news? In an article published in the Daily Telegraph, a British newspaper, Belize was ranked among 15 of the most underrated travel destinations in the world! What wonderful news for our beautiful country. 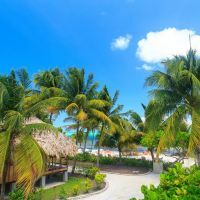 We hope this encourages more people to visit our little slice of paradise in the Caribbean with beautiful beaches, an abundance of history and culture, and amazing dive spots like the Great Blue Hole and Belize Reef. 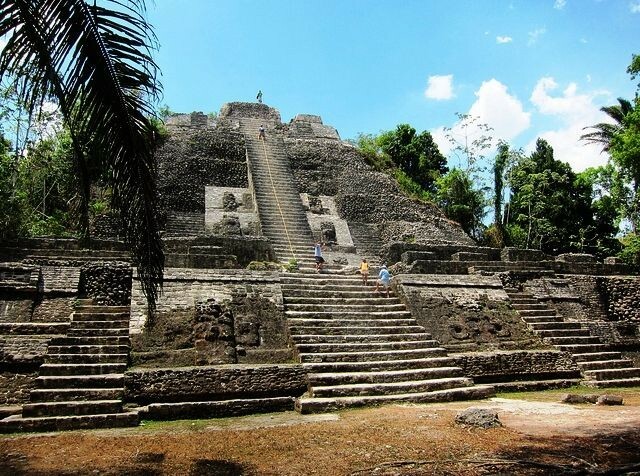 The author of the article writes, "One joy of traveling here is how empty Belize seems. While neighboring Mexico and Guatemala are famously populous and exuberant, here the roads are quiet, the beaches are relaxed and the archeological sites are often blissfully free of crowds." Can you imagine a vacation with little to no people? That's exactly what you'll experience here at St. George's in Belize! 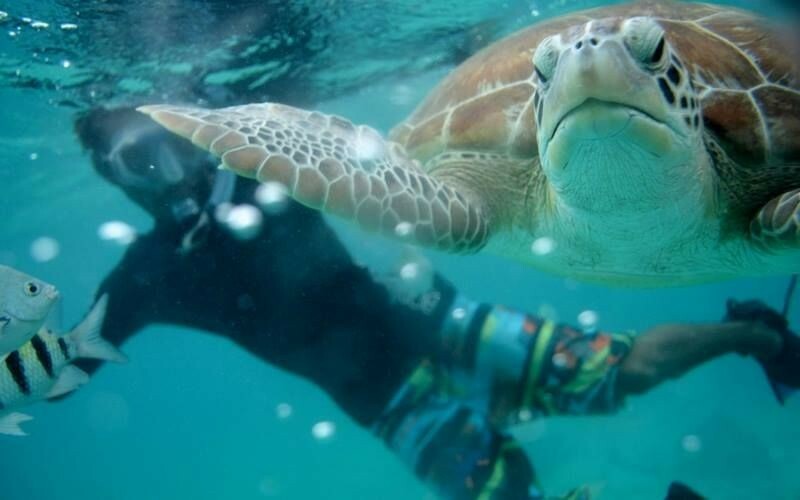 Based on years of introducing guests to this amazing travel destination, the team at St. George's has a list of our favorite activities, besides the awesome diving and snorkeling on the nearby reef. We can introduce you to these spots with our in-house tour guide on small, private tours. See everything you want, ask all the questions, take all the pictures! Our island's close location the the mainland means you have easy access to jungle adventures to see Maya ruins and you won't waste precious time traveling back and forth. 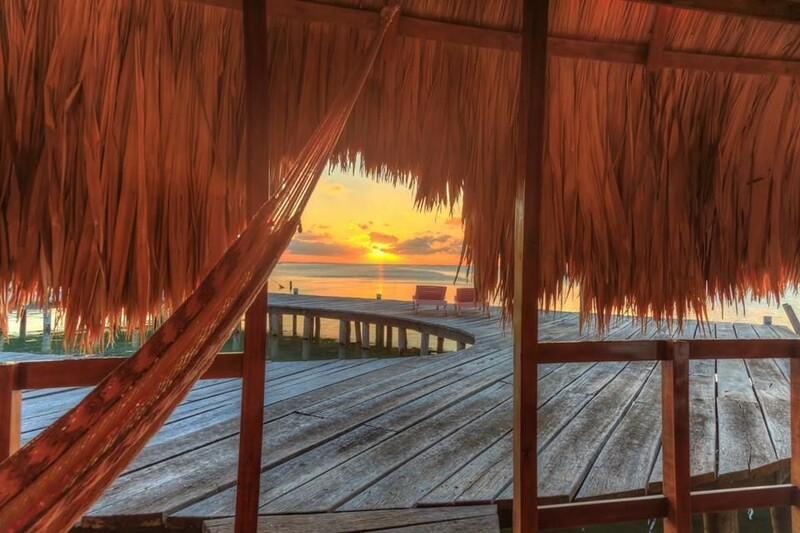 We're the perfect island location if you want privacy and seclusion, but also be close to all the adventures and fun of Belize! What is a Resort Dive? Learning to scuba dive is an amazing experience, but not everyone is ready to jump in for the full open-water scuba certification course. That's where the resort dive comes in! 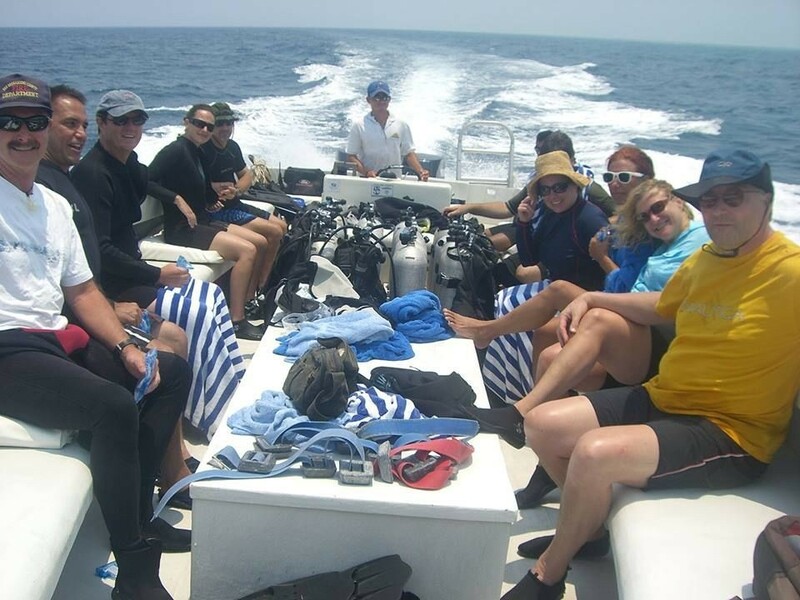 A resort dive is a safe and excellent introduction to scuba diving that requires no previous diving experience. The half-day course is very popular because it lets you experience the underwater world without having to invest a lot of time. The open-water certifications require classroom time, an exam and take 4-5 days to complete. The experience and cost for a resort dive can be credited towards further training if you later decide to get SCUBA certified (usually for a period of six months). What's Included in a Resort Dive? Resort courses are a half-day and may include your dive equipment such as BCD (buoyancy control device), regulator, gauges, tanks, and weights. During the course you receive basic training from a Certified Dive Instructor (CDI) on safety and equipment, followed by a dive in open-water to a maximum depth of 30 feet. After completing the course, you are free to dive as many times as you like as long as it is with a CDI and the depth is no deeper than 30 feet. 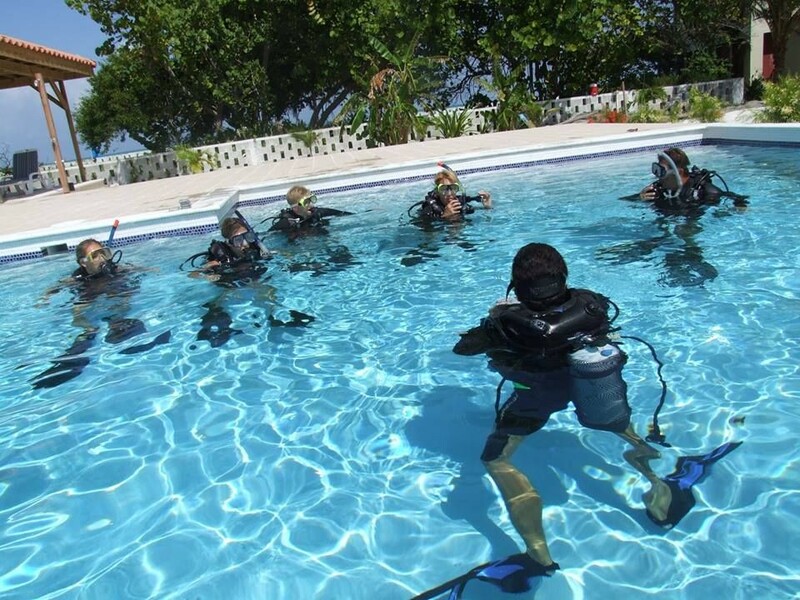 Most dive centers in tourist locations offer this introductory half-day course. SSI calls the course "Try Scuba" NAUI calls it "Try Scuba/Passport Diving" and PADI calls it "Discover Scuba." Our resort has a SSI-Certified Dive Center and we offer "Try Scuba" to our guests. In fact, you can complete the introductory session with our CDI for FREE in the pool! Afterward, if you like it, we will take you out to the reef for your official resort dive. The dive sites are only 5-10 minutes away by boat. Learn more about diving with us. 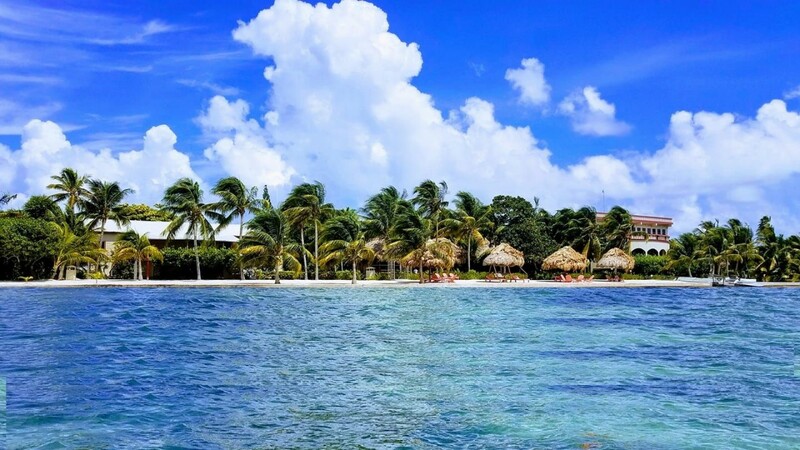 Belize has become a popular tourist destination for many reasons: the fabulous weather, friendly people and the fantastic variety of activities on land and in the water - especially the scuba diving and snorkeling. 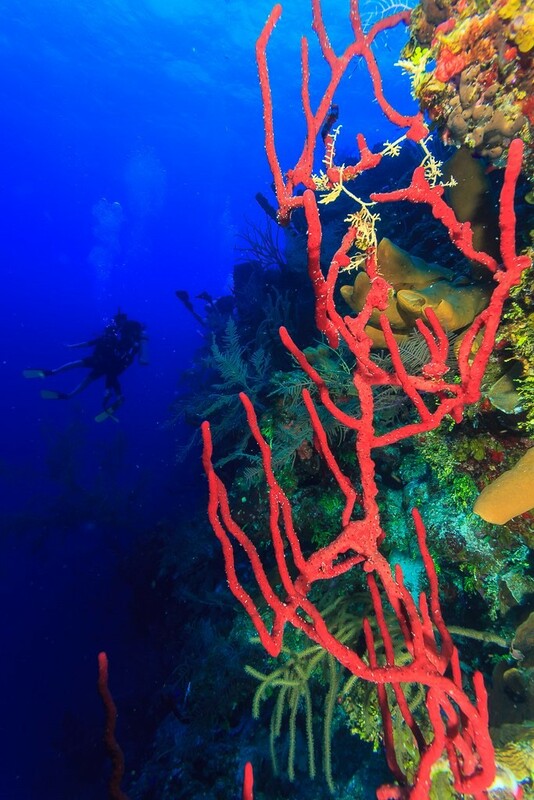 As a scuba diver, you are no doubt considering Belize because of the second longest barrier reef and bucket-list dive sites like Lighthouse Reef, Half Moon Caye, Great Blue Hole, and Hol Chan Marine Reserve. The diving here is out of this world! We know you won't be disappointed. But even the most avid diver needs surface time. 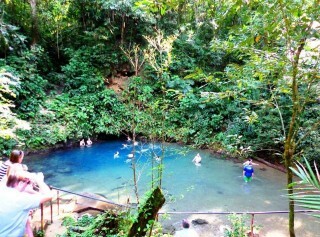 So, what else is there to do in Belize? We've compiled a list for you! 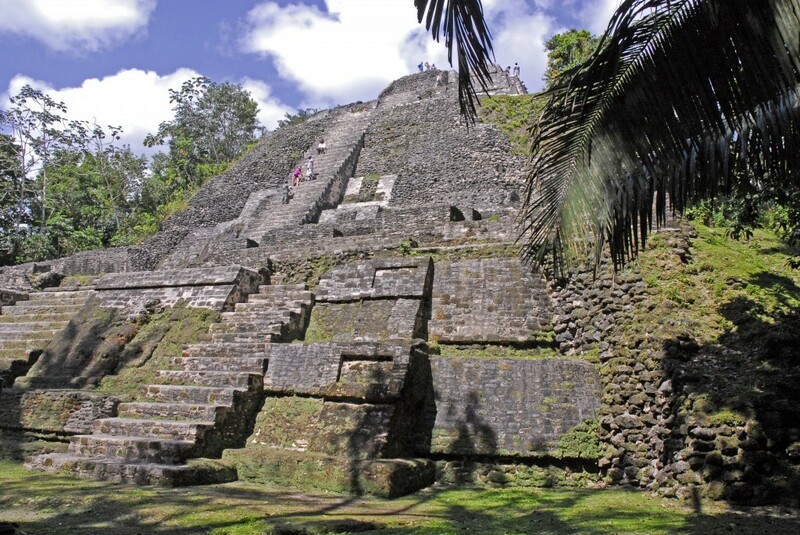 Visit Maya ruins such as Xunantunich, Caracol, Altun Ha, Cahal Pech, and Lamanai. 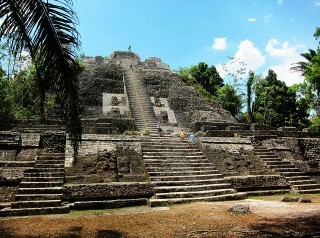 Tikal is just over the border in Guatemala and also accessible as a day trip. Relax with a hot stone massage. Whiz through the jungle canopy on a zip-line tour. 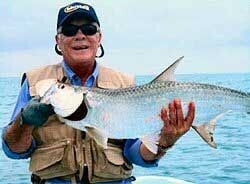 Take a guided fishing trip for the "big three" of tarpon, permit, and bonefish. If you prefer to reef fish, you are likely to catch snapper, grouper, barracuda, and more. Kayak through the mangroves and along the reef. 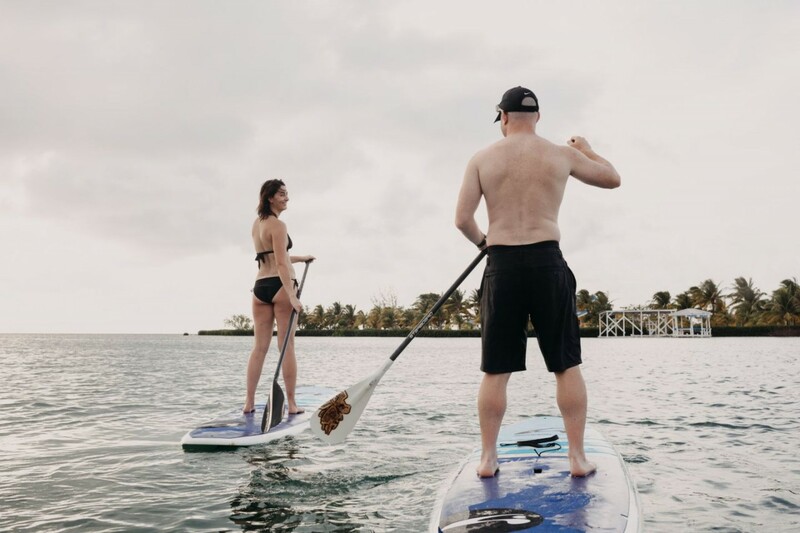 Try the standup paddleboarding on the calm waters around the mangroves and cayes. 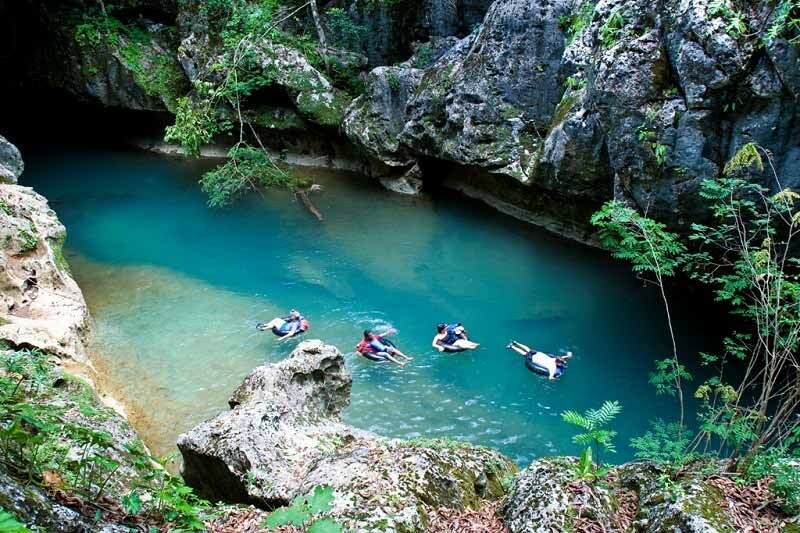 Go cave tubing on a jungle river with headlamp and helmet. Take a helicopter or plane ride over the iconic Great Blue Hole. 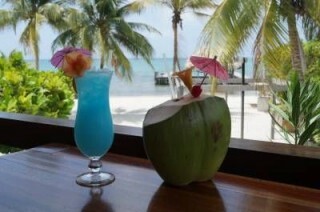 Visit beach bars and go shopping in San Pedro, Ambergris Caye (La Isla Bonita). You can also try parasailing or sky diving while in San Pedro! Buy gorgeous handmade arts and crafts from locals. Drink tropical cocktails and Belikin beers on the beach. 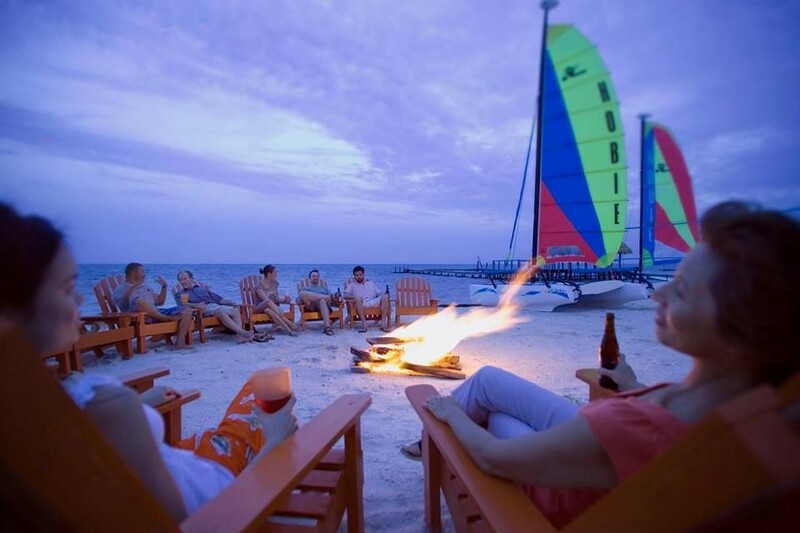 Many of these recommended activities can be done here, or on one of the private guided tours we offer from St. George's Caye Resort. 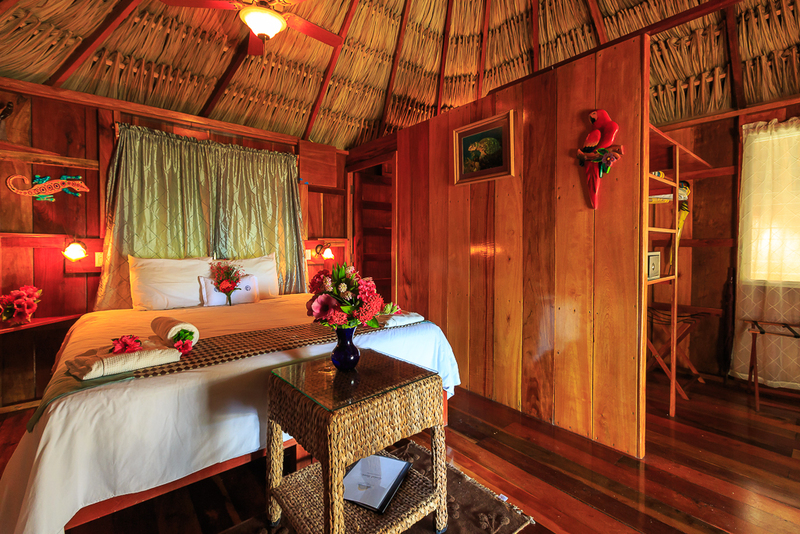 If you want more jungle time, we also have jungle-beach combo packages where you spend three or four nights on the mainland of Belize, then you come to our island paradise for the remainder of your trip. We are less than a mile from the reef for diving, diving, and more diving. Did you see the amazing deals? There are round-trip flights to Belize for less than $350!! Airlines are getting very competitive for summer travel and we are seeing the lowest airfares to Belize in almost 20 years. If you've been waiting for the best time to visit, here it is! Summer 2018. A member of our team recently purchased tickets for a summer vacation and she had this to share: "What I have found in the past week is that prices can change within the same day from morning to afternoon, and may go up again for two weeks, then suddenly drop again. My tip - set a reminder to check multiple times every day and be ready to BUY when you see a good deal!" Which Airlines Fly to Belize? There are connecting flights to Belize through Houston, Dallas, Miami, Atlanta, Newark, Chicago (seasonal), Denver, and Los Angeles. Flight time is just over two hours from Texas airports, making Belize an easily accessible destination for most of the US. The following US-based airlines fly to Belize (BZE): United, American, Delta, and Southwest Airlines. Plus several international carriers like Copa and Avianca, and the local Belize carrier Tropic Air does international flights from Honduras and Mexico. So now you know how to get to Belize and when to find the best deals on flights. What are you waiting for? We can't wait to see you in paradise this summer! Is it summer break yet? Thinking about summer vacation? Good because THIS WEEK is the best time to find airfare deals for summer travel! According to Travel Pulse and a recent report by Hipmunk, booking your summer holiday flights the week of April 23 can save up to 16% on Memorial Day and 14% on Fourth of July flights. Average booking price for a ticket purchased this week is $279. Saturday, August 25 is shaping up to be the least expensive day, with average prices hovering around $224.